Six full size bars wrapped in colorful cigar bands and stacked inside a tall Cellophane Bag, including Mountain Morning Wake Up Call, Blue Ridge Wildflowers, Fresh Mountain Air, Appalachian Sunrise, Carolina Kudzu and Mountain Rain. A beautiful gift anytime of the year. 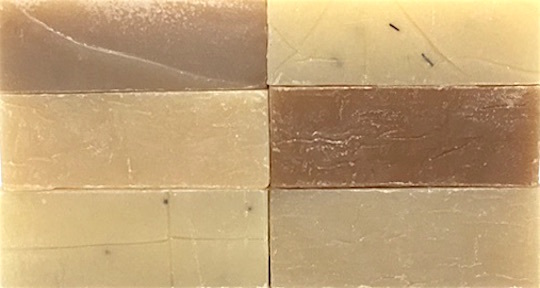 Olive, Coconut, Palm and Castor Oils, Sodium Hydroxide or Lye, Mountain Spring Water and/or Goat Milk, Shea and/or Cocoa Butter, ground botanicals, and scent by Natural Essential Oil or artificial fragrances. Complete, specific ingredient information is provided on each soap cigar band.